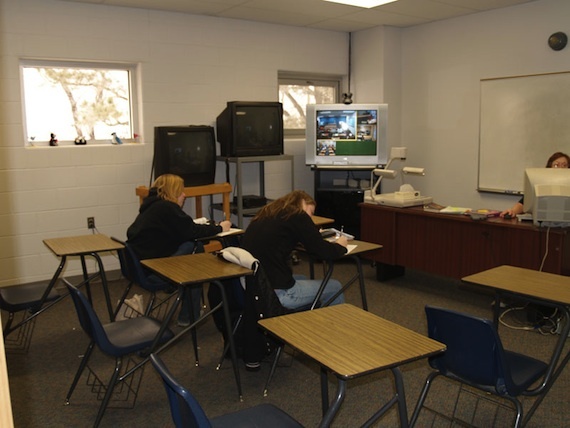 Videoconferencing is saving some remote schools in Colorado and delivering courses required for students who expect to attend college. As valedictorian of his senior high school class, Jed Michal was naturally expected to give the commencement speech during the graduation ceremonies of his East Colorado high school. Though stuck in a Texas hospital a week out from a bone marrow transplant for leukemia--a disease that had robbed him of his entire junior year at Flagler High School in Flagler, CO--he was able to deliver that once-in-a-lifetime address thanks to videoconferencing technology implemented by his district's regional co-op. Michal's alma mater is in one of the most sparsely populated areas of the United States. The East Central Board of Cooperative Educational Services (EC BOCES) governs 15,000 square miles with 21 K-12 school districts, most with only a few hundred students total. Vast geography and declining populations were perilous to many smaller schools and presented challenges for the responsible co-op. "These are very small districts, and only a couple of them actually have more than one building," said Emma Richardson, distance learning coordinator for EC BOCES. Leaders there eventually determined that videoconferencing was the only way to keep delivering a variety of quality classes to all the schools in need. The resulting initiative, the Video Networking Educational Technology System (VNETS), connected 17 participating districts with each other and with world at large via videoconferencing technologies. Among the priorities was providing language classes to high school students, especially after colleges added two years of foreign language studies to their admissions requirements. "We just cannot support foreign language teachers at each of our schools," said Richardson. "Second to that is access to college content for our high school students," she continued. "It really gives them a head start to be able to transfer college credits when they graduate." The solution was a combination of installed and mobile Polycom videoconferencing systems. VNETS, now in its fourth year of implementation, has addressed the critical needs, and is being used for other things as well. "The past four years, we hired a Spanish teacher who teaches out of one location and provides classes to six to eight districts exclusively," said Richardson. "Then we started a relationship with a school in Arkansas and brought in two more Spanish classes and a French class as well, so we were able to deliver eight periods of high school Spanish and one of high school French." Richardson said upcoming budget cuts are impacting the number of teachers at each school, so more districts plan to use VNETS to share teachers for the coming year. That includes, said Richardson, districts that plan to share high school government and geometry classes. "Our districts are really looking to expand that high school side as they deal with budget cuts. It is a sad place to be, but at least we have an option for them." On the college level, VNETS delivers English, government, algebra, calculus, and more, for which high school students receive community college credits. Virtual field trips are increasingly popular among the East Colorado districts as well, and VNETS makes frequent use of The Center for Interactive Learning and Collaboration to locate content. Students of all ages are able to visit art and history museums, zoos, and even other countries virtually from the comfort of their classrooms. "We have connected to the Alaska SeaLife Center and to the Cleveland Museum of Art," she said. "During the Kigluait Dog Sledding virtual field trip, we literally connected to these people in a little tent on the ice. They have the dog sled teams there; they talk about sledding and how they take care of the dogs." Another virtual field trip taught high school students about careers in Alaska. "The students learned how to identify different seals and sea lions and watched seals swimming in a tank behind the presenters." NASA is a popular source of virtual field trips for EC BOCES. "They are great because they are free," said Richardson. "They offer single classes about the space shuttle or asteroids, and NASA also offers project-field trips where they will meet with a class twice, giving them a project the first time, then the second time the class comes back and presents the project to NASA." One recent NASA project had the smallest EC BOCES district build a habitat that could be used on the moon. "They presented how to deal with water and trash on the moon, and received feedback from NASA about their findings." VNETS is frequently used for professional development for teachers as well. Another unexpected use of the system is in athletics. District basketball referees absolutely love the videoconferencing system and meet regularly during the season. Videoconferencing has saved them gas money and hours they used to spend on travel. Despite enthusiastic participation by many, Richardson said one of her biggest challenges is getting teachers to teach over the system. "It is a little extra work, learning to work back and forth with multiple districts." Discipline is also an issue. "Kids are like, 'What are you going to do? I'm here, and you're there.'" In addition, while classes are high tech, there is still a huge need for paper: in particular, faxes. Districts spend a lot of time and paper faxing documents back and forth. "When you get into math, a lot has to be faxed because not everyone uses the same application," explained Richardson, "and in Spanish, you have the letters and accents which are hard to reproduce." On top of it all, students don't always have computers or Internet access at home, which means they need hard copies from which to complete homework assignments. Richardson is developing online materials, including online courses and quizzes. "We cut faxing in half last year," she said. "But there is still a lot." The overall results of VNETS are positive, the biggest win being, of course, the ability to keep small schools open by providing students across the districts access to classes they wouldn't otherwise be able to take. "This program has been so successful that we are currently pushing capacity on our equipment," said Richardson. Expansion plans include integrating a new bridge that will take VNETS from 24 endpoints to 40. The current bridge can accommodate 24 people dialed in to anywhere at any one time. Between 9 a.m. and 10 a.m., VNETS districts used every one of those points. With all end points occupied, the IT managers couldn't even dial in to perform an assessment when there was a problem. In addition to expanding end points, some districts will be adding a second videoconferencing system to expand videoconferencing activities, and, Richardson said, they are currently evaluating desktop systems to accommodate meetings. Another application in VNETS' future is teletherapy. "The speech department will have one speech therapist, and instead of having to drive hundreds of miles to visit the schools, she can tap into the computer from wherever she is and work directly with the students or work with a paraprofessional working with them," Richardson explained. VNETS is also installing networked Smart interactive whiteboards in 18 rooms. "We just received a Morgridge Foundation grant to do it, and we're very excited." Besides the 18 classrooms, they installed one board where the Spanish teacher is based and one at the EC BOCES office for professional development. "The exiting thing about these interactive whiteboards is we can conference them together," said Richardson. "That means a math teacher in Burlington, CO puts a math problem on the board, then the student in a remote class can go up and put the answer up on the board, and everyone can see it. This allows for more interactivity; we are trying to get the kids moving in the classroom. When dealing with videoconferencing, it's easy for kids to sit in the back and sleep, so sometimes it's not as interactive as it should be." When complete, the interactive whiteboards will allow students and teachers to collaborate through the board as if they are in the same room, she said. "I believe that we are the first program to attempt this integration and we are very excited about it." Implementing some of these plans, such as teletherapy, is dependent on a pending grant. "We find out in September if we can move forward," said Richardson. "If not, we get very creative at that point."